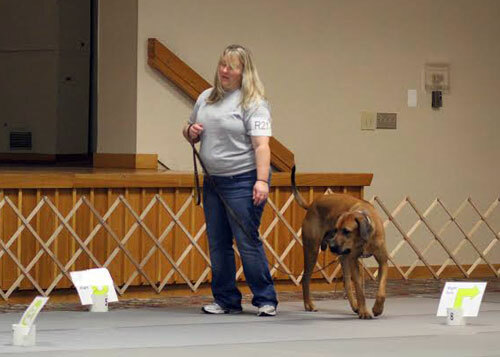 "An Introduction to AKC Rally"
AKC Rally is a FUN dog sport created with teamwork in mind. It is a series of obedience exercises printed on signs that are set up in a numbered course format. You and your Ridgeback walk through the course trying your best to do the exercises listed on the signs, heeling in between the signs. The course is designed by a judge who stays in the ring with you during your turn. 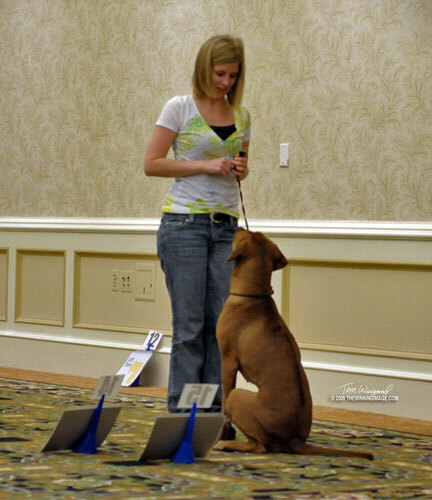 The handler can actually speak to and encourage their dog throughout the course as much as he/she chooses, setting it apart from traditional obedience competitions. AKC Rally was also created to bridge the gap between the AKC Canine Good Citizen title and Competition Obedience and Agility. It is fun for novice pet owners, while also allowing those who are serious about obedience to gain ring experience, and be more competitive in the higher levels of Rally. Starting November 1st 2017, clubs may offer a total of five levels of competition. In addition to the Novice, Advanced, and Excellent levels, an Intermediate level may be offered, as well as a Masters level. The Novice level is performed all on-leash and tests the dog and handler's skills with basic obedience exercises. The Intermediate level has been added as an optional bridge between Novice and Advanced levels. 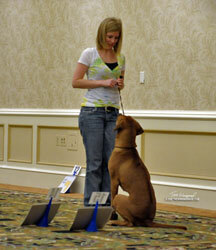 Just as in Novice, the Intermediate level is still performed all on-leash, but a few more difficult exercises are added. The Advanced level of competition follows the same format as the Intermediate level except the Advanced level will contain a jump, and all exercises are performed off-leash. The Excellent level is also off-leash and adds more exercises of increasing difficulty; this level concludes with a brief sit-stay while the handler retrieves and puts the leash back on the dog. The Masters level is a new class that is performed off-leash with new exercises that either reflect traditional obedience skills (e.g. recalls over flat and over jumps) or were created specifically for AKC Rally (e.g. side-by-side 360 degree turns of dog and handler next to each other). To get started in Rally please read the rules available on the AKC website, as well as familiarize yourself with all the signs. Then you can find a Rally class near you to begin practicing courses with your Ridgeback. Each year, dogs who meet specific criteria in AKC Rally trials are eligible to enter the AKC Rally National Championship (RNC). Below is the link for the list of Ridgebacks who met the criteria for this year!